I have a Fuji S5000, which was, a few years ago, quite a good digital camera. It emultates an SLR, though it has a fixed lens, and it shoots at 3 Mega Pixels (or 6 if you’re happy to use compression). 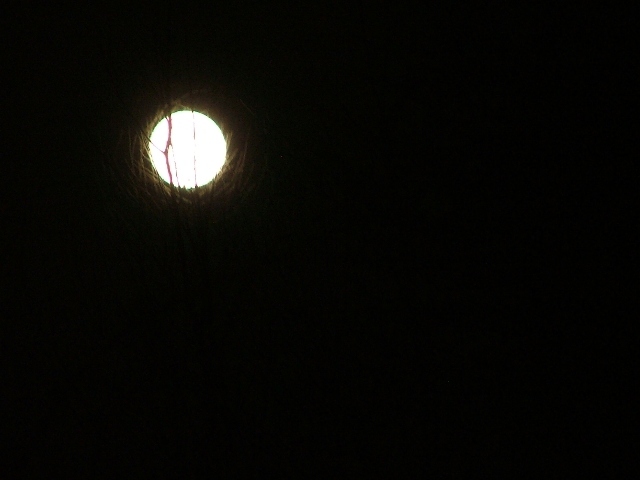 I tried a monopod, but the moon was all over the place. Finally I turned an old garden chair on its side, attached a clamp and painfully knelt on the rocks that are strewn over the garden path. 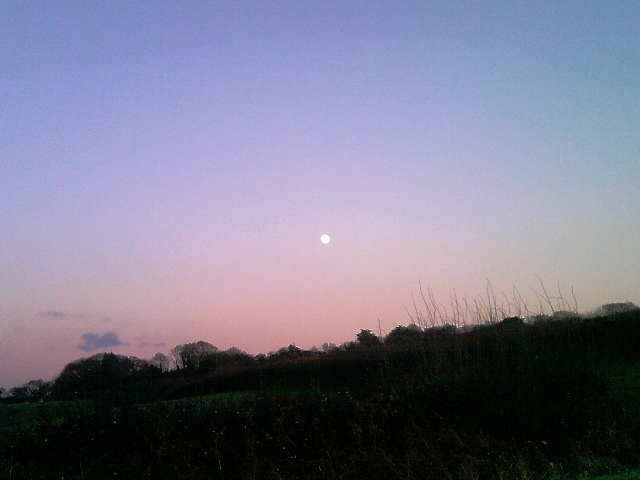 The result: wonky soft moon through shrubbery.I need a better camera. I use to have a Nikon FMII and a slew of lenses. It and they were beautiful, though not as instant as digital. I will get a good shot of the moon. I will! Had I had a decent camera with me (and a tripod) this would have been an orgasmic photograph. As it is the full moon, or as close to a full moon as makes no difference, is rendered into a small white dot which is not at all fantabulous. Miffed and pissed off I am, not to mention the wibbling lower lip. So! The obvious adage is: always remember to carry a good camera, dickhead! Mea culpa. In the other direction was an amazing, blazing, fast sinking ball of wonderment called the Sun. I missed that too. C’est la vie … shrugs in Gallic fashion and wanders off to dream of whatever wannabee photographers dream of when they’ve missed a great photograph….